Anyway here’s a quick summary of how I got on with some of the gear I took. I’m only going to comment on items I’ve started using this year, or one’s which excelled or expired. I purchased the GG Gorilla earlier this year and had used it on a few overnight trips before the TGO, including a tough three day trek in Snowdonia. Overall I really love this pack, it carries like a dream and is easily the most comfortable pack I’ve used. GG say it is comfortable to 30 lbs (13.6 kg). I would say that’s a little on the optimistic side and would only use it for up to 12 kg loads (which for extended trips means maximum base weight of 8.5 kg). I carried about 13 kg on one day after loading up with five days worth of food and I could feel the shoulder straps transferring a liitle to much weight to my shoulders. Comfortable carry aside, I can’t help highlighting a few small niggles that had me frustrated on occasion. None of these are deal breakers, and I can forgive any of them against the sheer comfort of the pack…but the Gorilla is frustratingly close to being superb. First there’s a couple of issues with the webbing, particularly on the hip belt. An elastic retaining loop which aims to hold back the lose end of the hip belt is forever sliding forwards and jamming itself in the belt buckle. When you have gloves on it’s a fiddly job to keep pulling it out of the way so you can tighten the belt. I’ve now tacked these back by sewing them to the rear webbing where it meets the padded part of the belt. Then there’s the webbing itself which I find too soft and flexible. Lovely to handle, but it has a habit of folding double into the buckle as it slides through. When the belt is then loaded this could place excessive strain on the buckle and potentially could snap it. I’ve also had the same problem on the shoulder straps, but less often. The pockets on the hip belt are great, but a touch on the small side. They’re barely more than 2-3 cm deep and could do with being another 1 cm deeper. One single flat object can take up almost all the room in the pockets. The belt pockets on my ULA packs are deeper and more usable. They’re also not at all waterproof, but we’ll get back to that in a minute. It’s very useful to have that top pocket on the lid flap, something I really miss with most roll top type packs. But…it comes with a frustration. If you’ve got anything in that top pocket while you’re packing the main sack, the lids continually wants to flop down over the neck of the sack. This means you need to hold a floppy sack open while trying to pack it. It’s almost a three handed job. While not frustrating as such, a couple of comments on the Robic fabric used for the main body of the pack. There’s no doubt it’s robust and should take a fair bit of punishment. But it is in no way waterproof, and only marginally water-resistant. Without a pack cover, water easily enters the main body of the pack, lid pocket and belt pockets. And there’s something about the fabric or its grey shade which shows the dirt. Because it’s a plain weave with no pattern or texture, the dirt really stands out. After only 20 nights with this pack it looks dirtier tan the ULA packs I’ve had for years. Lets not end on a negative note however. This is a brilliant pack, supremely comfortable, and for want of a few small issues it could be outstanding. It will still be my pack of choice for spring/summer trips. Last year I didn’t take the Tarptent Notch as I wasn’t sure how it would stand up to strong winds. Since then I’ve made a few modifications (extra tie out points etc) and I’m happy to report that it stood up well. 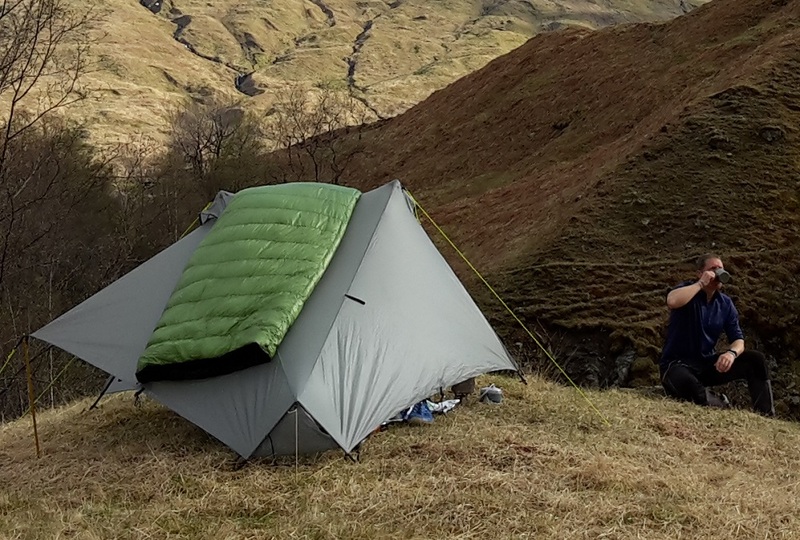 I’m sure the winds in Glen Coe on one occasion were gusting 50-60 mph, and the little tent stood it’s ground. It’s a little tight on space, but at 700g with two vestibules, it’s the favourite of all the tents I currently use. I’m planning a separate post on this as I’ve now had it for a few years and done quite a lot of mileage with it. The mods I’ve made make it a good choice for me for the UK. It’s beginning to feel like an faithful old friend. After getting cold on last years TGO using a 1 season sleeping bag, I purchased a ZPacks 20 degree bag earlier this year. I’ve used it now for a little over 20 nights and so far I’m pretty impressed. I don’t miss the lack of a hood at all and quite like drawing it around my neck and using it in combination with BlackRock Down Beanie when the nights are really chilly. It lofts well, packs down small and is well made. I’ve also not found the lack of a zip baffle to be an issue. Considering it’s feather-light weight, it’s certainly a warm bag. Having said that if I were to buy this bag now, I’d probably go the full hog and buy a 10 degree version. The extra weight would be worth it for the additional warmth. One thing you need to be aware of are the continuous baffles. This is a deliberate design feature so you can redistribute down to alter how much sits above or below you, but the down has a slight tendency to migrate into the underneath side of the bag when you loft it. So you need to remember to shift it back to the top before sleeping, otherwise you waste all that down by lying on it. One slight negative, and not surprising considering the weight of the fabrics used, is down leakage. It’s not excessive, but on most mornings I’ve noticed the odd quill poking through the top fabric. A quick inspection to pull any back through from the back each day sorts that problem. I’m half way migrating from traditional boots to trail running shoes, I’ve not taken that leap of faith yet. I’ve gone back to Salomon after a few years using other boots, and these proved supremely comfortable straight from the box. I’ve done 350 miles in these now with not a single blister or sore point. The grip is acceptable, though not outstanding, and they dry reasonably quickly considering they have a Goretex liner. They also kept the water out surprisingly well, not completely of course but they didn’t leak as bad as I’d expected them too. If Salomon could just do a version of these without the Goretex membrane they’d be excellent. I still can’t figure out why boot companies persevere with goretex membranes, it simply doesn’t belong in boots and can ruin an otherwise good design. It doesn’t work. I bought my Rohan Elite jacket for a knock down price on Ebay. The Barricade fabric it’s made from has a nice soft feel, very quiet in use, and it’s reasonably light at 330g. Design, fit and features are all there. Certainly a nice jacket to wear. In use it’s odd however. Water beads on it for a while in heavy rain, then the fabric wets out…but doesn’t let water through. It sort of ends up looking damp, but still keeps you dry. I found breathability to be good in all but the most prolonged deluges. It’s big downside is washing and care. Once home I put it in the wash with another couple of pieces of shell gear, and the fabric suffered somewhat from being abraded by Velcro. Fine fibres in the Barricade fabric get stuck to Velcro and can pull away from the face of the fabric, which seems to be comprised of a matt of fibres rather than a weave. In fact washing almost destroyed a seem around the inner pocket. It makes me wonder about long term durability. As a bargain ebay find the jacket is good, but if I’d paid full price I’d be asking questions. The Berghaus Paclite Pants were superb as ever, but the ankles did get a bit trashed walking through deep heather and I’ve had a to do a few repairs since. I wear gaiters a lot, even in dry weather just to keep trousers a bit cleaner and keep out ticks. So I bought these for the venting option they provide; a good sized section of each gaiter can be unzipped and pulled to one side to allow venting in drier weather. They’re also a funky shade of green which I quite liked. Fit, length and weight are good and on first impressions they look like the dogs doodahs. But……the TGO almost destroyed them. Firstly one of the Velcro strips simply ripped away from the stitching when I opened one of the vents. Luckily this didn’t rip the fabric so I should be able to re-stitch this back. Then the straps under the boots wore away to almost nothing. These are not easily replaceable as they’re actually sewn in. And finally, they don’t breath, at all ! These are marketed as a desert gaiter so you might expect them to breath in hot weather. The calves of my trousers ended up more than a little damp whenever I wore these, even with the vents fully open. In summary these gaiters look great, but their performance is not. Rohan Core Silver Zip : Taken rather than my usual BAM baselayers as I would have few opportunities to wash clothing. The Rohan Zip washes easily, dries pretty quickly, and keeps the odour at bay for a few days. I liked it a lot. Haglofs Mid Flex Pant : I was keeping spare clothes to a minimum so I took a slightly heavier pair of trousers as I would never have to carry them. These are great, just a bit warmer than the Montane Tera’s I’d normally take and I love the stretch panels on the legs and seat. Great trousers. Marmot Stride Vest : Never needed to use it. A baselayer, micro fleece and either a shell or ultralight down jacket were all I needed. UniQlo Ultralight Down Jacket : At 210g and £40 this continues to be one of my best ever buys. Super soft and cozy. Just warm enough, but not overkill. Rohan Ultra Silver Shirt : I take this for sleeping and as a spare baselayer. Weighs less than a whisper, washes and dries easily. Spare Socks : Never used them, I managed to wash socks every other day and dry them over the roof of the inner tent overnight. Buffalo Mitts : I meant to proof these with Nikwax before the trek, but dropped one on the stairs carrying kit to the washing machine. On rainy days one hand stayed perfectly dry, the other got soaked. These are still superbly lightweight warm mitts. Some kit is never bettered. 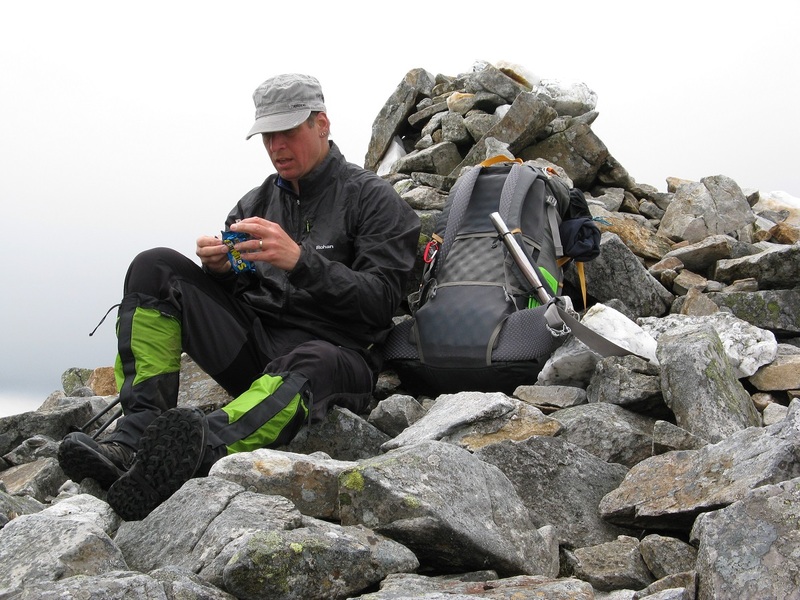 BlackRock Down Beanie : Works great with the ZPacks sleeping bag. FM Radio : This year I took one with a proper old fashioned aerial rather than an integral one. I wired it to my trekking pole at night, and hey presto, I had Radio 4 all the way across Scotland. Charger (one that runs off AA batteries) : In a word, rubbish. It would only transfer part of the charge available from AA batteries, leaving you to throw the batteries away half used. In the end I threw away the charger itself. Sitmat : I’ve only recently started sticking a little sitmat in my pack side pocket, It’s a sign of encroaching age don’t you know. It’s now a staple piece of kit. Makes a cold lunch break infinitely more enjoyable and comfortable, not to mention keeping your posterior warm. OK, well that’s the lot. Overall I was extremely pleased with what I took and wouldn’t have changed much at all. Just a couple of minor niggles which didn’t in any way detract from enjoyment or comfort. Have you tried to see whether your ULA Circuit hipbelt will fit to the Gorilla Pack? Aren’t they both detachable with a similar velcro attachment? Would overcome some of your niggles re small hip pockets and webbing. Certainly worth a try David. The only difference is that the hip belt on the Gorilla is almost free floating, whereas on the ULA you have those webbing buckles at the rear to pull the pack into your hips. I agree on the Gorilla totally. And Mine now has a hole in the hip belt pocket. Mind you I fell over and mangled it on a jagged rock. But the webbing is poor. Mine did all the same things. And on a plus note, it is an issue that Grant at GG has said will be sorted out. Love my ZPacks 20F too. With a PHD down hat & a buff, no need for a hood. If I didn’t have a warmer bag I too would go with the 10F. You can use the foam back out of Gorilla for a Sit mat. That said, I didn’t cos it would end up wet and manky in Scotland. Funnily enough, same issue with my Paclite trousers. Bomber but the bottoms are getting mangled. Nice route by the way..
For the sake of 20g a small sitmat stuffed in the side pocket saves me having to try and shoe horn that back pad back in after using it. It’s looking a bit scuffed as it is so I tend to leave it where it is. I guess there will always be a trade off with light weight packs and robustness, but I think a few tweeks and the next version could be even better. 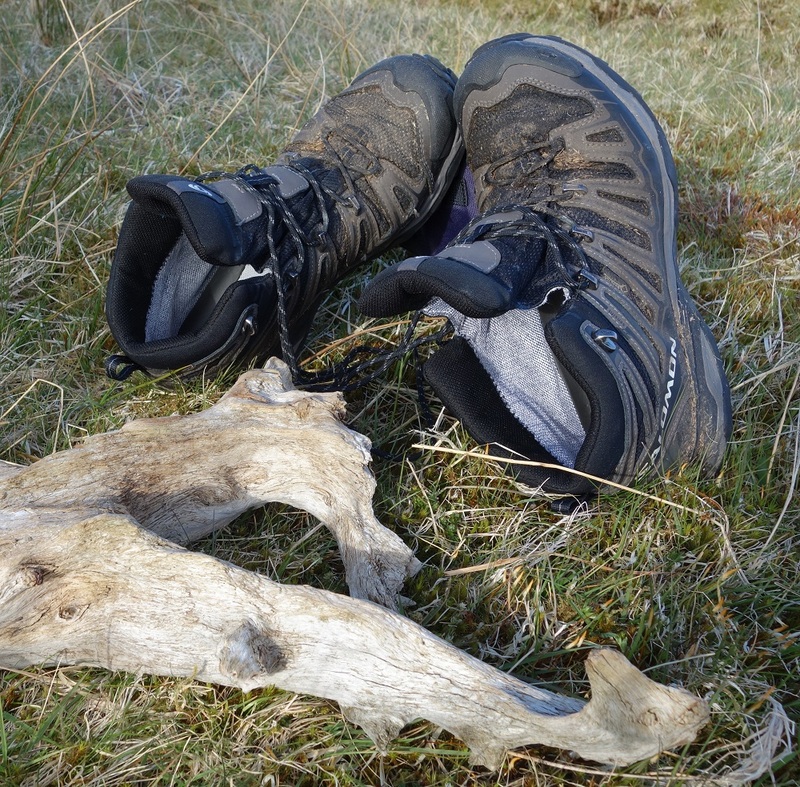 Always interesting to know how gear fared on a long walk rather than an overnighter. I like the Salomon X Ultra Mids a lot. I took my leather Ecco Biom Mids, because the leather provides a much more weatherproof skin. However, one of the Chalkengers I met (Wayne) was using X Ultras with Sealskinz socks and a liner with talc. He reckoned this kept him dry and comfortable. Might be worth a try. My Marmot Essence overtrousers are even more delicate than the Berghaus Paclites and I had to patch mine. I think a heavier pair are a better idea for off piste. I like the Notch, but looking at the dimensions, I think I might find it a bit cramped. If you want to uprate your sleeping bag, get a pair of As Tucas Sestrals 2 insulated trousers. Very light (185g), but warm. You can wear them around camp as well as to sleep in. Best bit of kit on my Challenge. I wish GG would go back to the old drawstring top and Y strap of the original packs. The hip belt pockets are a bit small. I took a smaller camera because of this. Also they need a flap to protect the zip from water ingress. I’ve made a drain hole in mine as well. The older, grid material doesn’t show the dirt as badly, but is as waterproof as tissue! I have an Essence jacket but not used it yet. SportsPursuit were selling them at a nice low price last week (£65 if i remember correctly) so I picked one up to stick on the shelf ready. The inner of the Notch is a bit tight, but I think sometimes we focus a lot of attention on the area of the floor pan and forget about area of headroom. Quite a lot of the area of some inners isn’t usable at the best of times, especially where head room is restricted. What I like about the Notch is the fact that the whole width of the inner has the full 115 cm of headroom, so although it’s not particulalry wide, you can use all that width. I may take at look at the Sestrals trousers Robin. I have a pair of Montane Prism Pants which I guess do a similar job but weigh a bit more are probably a bit overkill for wearing in a sleeping bag. Sestrals look like a nice bit of kit. Thanks Carolyn. I must admit I don’t tend to do gear reviews as such as I think most kit is very much a personal choice. We each look for something slightly diffent from our gear and the best choices are developed from experience. Also the best reviews are from long term use, by which time the piece of kit is either normally no longer produced, or there are dozens of first impression reviews already written. But sometimes niggles and kit failures are worth highlighting. Often it’s what we find didn’t work that builds that experience. Hi John, Just catching up with my reading. The Gorilla was on my list of pos. but the lack of waterproofing is a big turn off even if it is the best design. (Apart from a few niggles). I think I will stick with my Creon Light. The TT notch is a clever design mod from the Moment to use walking poles instead of dedicated hoop. It looks great and the extra head space is a bonus. The Uniqlo down jacket has to be the best VFM out there. Disappointing to hear about the Rohan Jacket but the Ultra Silver tee is still my no.1 baselayer. I’ve tried a number of UL packs over the years, but one thing I still hanker for is one with a good top lid pocket. It’s such a useful feature which is missing on a lot of packs out of North America. I sometimes wonder whether this has much to do with cutting weight, or simply because a simple roll top is much easier for a cottage manufacturer to produce. There’s probably more cutting and sewing involved to produce a top pocket than the rest of the pack. I used the GG Gorilla again this weekend in Garsdale, and even in slight rain I don’t trust it without a pack cover. It wets out just lying it on wet ground, and after only 20 days use the robic has taken on a slight mottled appearance. Comfortable pack let down by choice (and possibly colour) of materials. p.s. Picked up another UniQlo jacket recently, this one with a hood, while they’re still selling them. Just re-read this and the interesting thread of comments. Kept thinking “I must keep that in mind for next TGO Challenge” . That’s the TGO Challenge that only two days ago I vowed not to do, ever, again. Would that be the same TGO that I was only going to do the once ? So what happened two days ago to bring on this rash decision David ? JohnBoy – out of interest, what capacity is your pack? It’s a long time since I backpacked, but I’m determined to give it a go again next year. I still have my old Karrimor GR 65L. I found that even for two-night trips, it was almost full to capacity! Hi Stuart. I don’t go ultra lightweight, more comfortable lightweight. But I still manage with a relatively low pack volume. My main packs are a ULA Circuit (approx 50 litres), a Gossamer Gear Gorilla (40 litres) and a Haglofs LIM 45 (45 litres). For winter I occasionally use something a bit larger, but still less than 60 litres (ULA Catalyst). And for summer overnight trips I quite often only use something around 35 litres (Haglofs LIM 35 or an OMM Classic 32) even when carrying a full tent/sleeping bag etc. When I started backpacking almost 35+ years ago all my packs were 65-70 litres, but I’ve not used one that large in a few years now (I did LEJOG 30 years ago with a Jaguar S65). 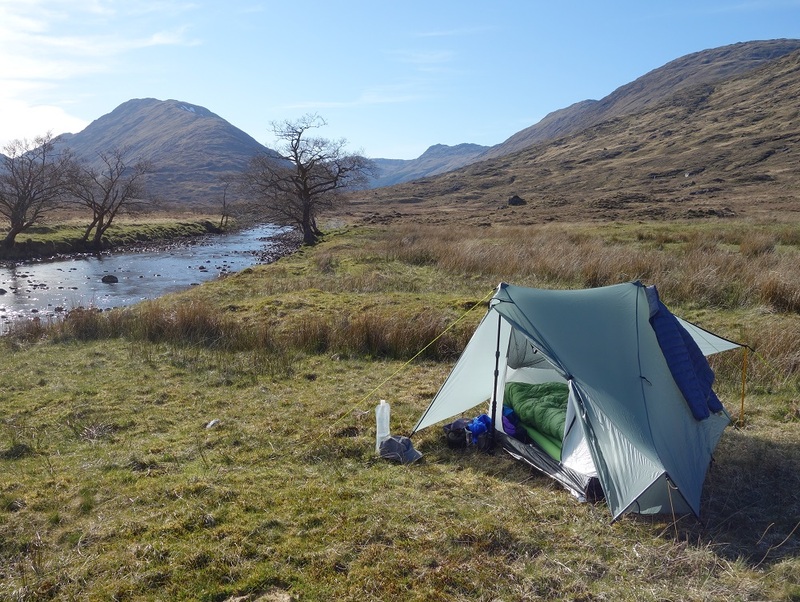 Take a look at my gear list for last years TGO Challenge….you’ll be amazed what you can get in a 40-45 litre pack these days, including 5 days food..
p.s. My advice would be to forget pack size for the moment and concentrate on reducing your individual gear weight and bulk. Then look for a pack that suits your eventual gear choices. I’d be interested to read what you’d typically pack? Hi, JohnBoy. First of all, that’s a hell of a collection of packs you have there! 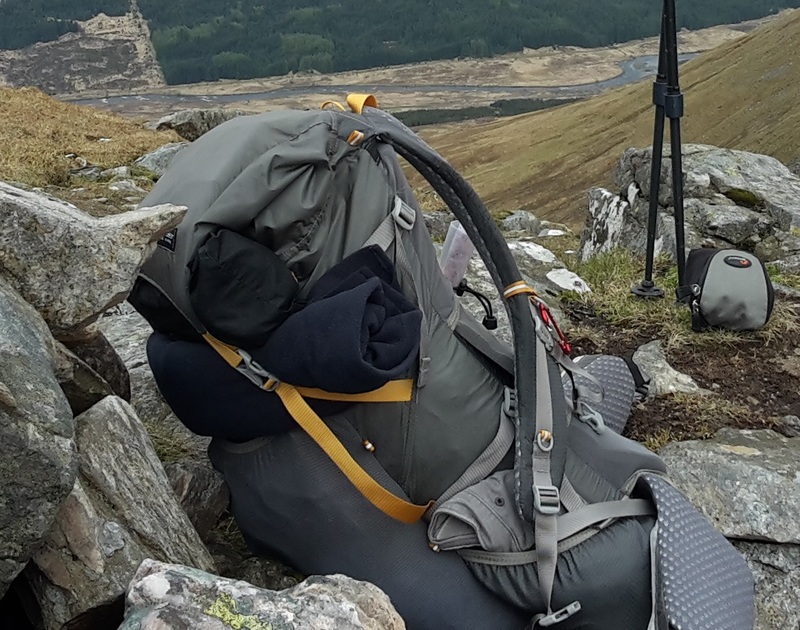 Having read your (very full) reply, it’s obvious that I’ve fallen behind in the years since I used to backpack, in the sense that I thought that 65L was ‘normal’ for even a weekend summer trip into the Highlands. That old Jaguar GR 65 is still with me; however in the intervening years I bought an excellent 35L pack (by Macpac). It would be great if that one would be enough for similar weekend forays… although I daresay I may have to invest in other lightweight equipment (tent and sleeping bag for starters!) to fit into the pack. Yes, I will be sure to check out your equipment list. Thanks again for replying. I’d be too ashamed to list all my packs; until recently I’d still got every pack I’d bought over 35 years of backpacking, climbing and mountaineering. I sold four recently in a clear out, but still have over fifteen. Many rarely get used these days, but some hold special memories. Amongst them two Macpac rucksacks which I used a lot in the Alps over the years. My memory is like that of a goldfish. I read this, as I see from my comment above, in July 2015. In October 2015, having forgotten all your comments, I press go on the purchase of a GG pack, and then have all the same issues with it that you have faced. Doh! But if it weren’t for your memory you wouldn’t have a shiny new pack your collection. I think GG have listened to some of the criticism. The pockets on the new hip belt are now twice as deep, and I see that they now produce a model based on the Mariposa which has a proper lid and top pocket. Hallelujah! As I said in a previous post, I’m certain that the real reason why most cottage companies only do roll-tops is because they are easy to produce. A proper lid would just add to costs. I don’t really believe it has anything to do with weight saving. But……that fabric still ends up looking grubby, and the webbing is still a bit on the soft flexible side.